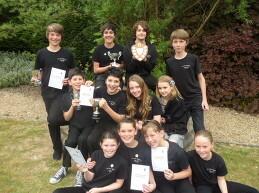 Act One Beginners has been competing in festivals since 2004 and has always done extremely well winning many sections as well as cups and awards in a wide variety of competitive sections including Acting Solos and Duos, Verse Speaking, Versatility, Musical Theatre and Improvisation. Unlike many schools, we do not select students to compete for the school in festival - absolutely any student who wishes to participate can. Beverly finds performance pieces and gives private tutorials to each competitor so that they can use what they learn in weekly classes along with their individual tutorials to enter festival and perform the best they possibly can. Because of this, competitive festival is always a positive experience for all participants as well as the audience who are always impressed by both the performances and the impeccable behaviour and warm support shown by everyone from Act One Beginners.